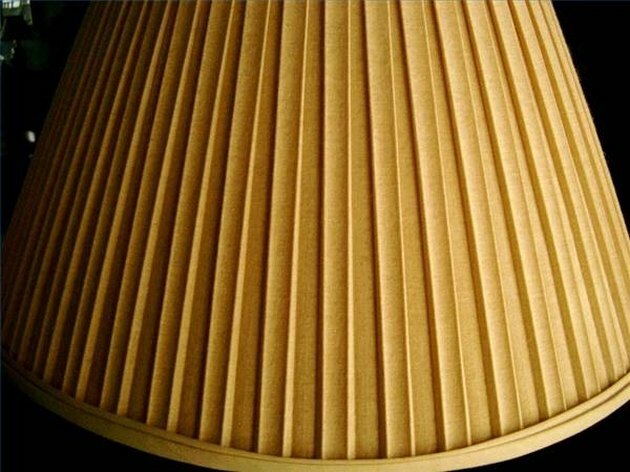 A pleated lampshade can add a touch of beauty and elegance to even the most ordinary lamp. A dusty and dirty pleated shade, however, can detract from the most expensive lighting in your home. Trying to find the best method to keep your lampshades sparkling clean requires a bit of ingenuity. Here are several methods to try on your pleated lampshades. Purchase a small paintbrush from a hardware store. Using downward strokes, lightly brush each of the pleated ridges. Roll a lint brush across the surface of the shade, or roll a loop of packing tape around your hand and use the adhesive to pick the lint off the fabric. Using the coolest and lowest setting, hold a hairdryer 12 to 14 inches from the shade's surface. Move the dryer back and forth using the air to blow stuck debris from the fabric. An air compressor is another useful tool to blow dust off the shade's surface. Place the upholstery brush on your vacuum. Turn on the vacuum, and lightly rub the brush back and forth across the shade's surface. Examine how the shade is manufactured. If it is sewn and not glued to the surface, you can immerse it in water to clean. Fill a bathtub about a one-quarter to one-half full of water. Place shade in water. Using a mild detergent, gently wipe the surface area with a cloth. Rinse all soap from fabric. Place shade in a warm area, such as a sunny location in your house, so that it dries quickly. Clean glued shades by using a mild detergent and water froth. In a bowl, whip detergent and a small amount of water with a hand mixer. Apply mixture to shade and wipe clean with a slightly dampened cloth, being careful not to overwet the shade surface. Place in warm area to dry.